Upstart independant German game developer Headup Games has announced their first title named GREED. The game is a gritty action RPG set in a sci-fi universe with a story that is said to be very "mature" and "adult." I'm not sure what that means exactly, but the screenshots remind me a bit of Space Siege. The good news is the game features a three player online co-op mode where each player can choose one of three different classes and help battle their way together. The game is set for a November release on the PC. No price point was given. Dueren, June 30th 2009 – Headup Games, a recently founded and independently financed publishing company for core PC titles located near Cologne in Germany is proud to announce its main project for this year to be GREED, a merciless hack'n'slash action-RPG. GREED is scheduled for release in November 2009. GREED takes your character, chosen out of three completely different classes, through manifold levels and environments, all playable in three increasing difficulty levels putting even the toughest endgame player to a test – but as always, more pain con-tains more gain! Embedded in various scenarios, GREED throws waves of deadly foes in your way as well as screen filling end bosses. But don’t despair! 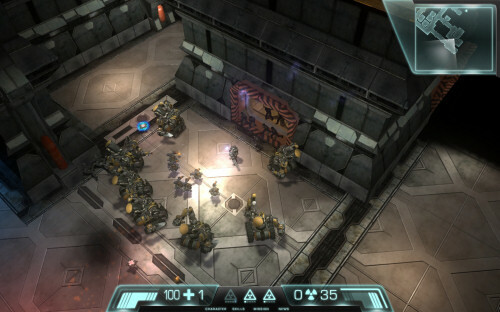 Helpful innovation can be found in numerous innovative features such as the unique dodge move, self-charging shields or destructible environments. The combination of the different character-specific skills and abilities in three categories gives you the diversity needed to conquer even the toughest foes. And if you need a little more support, GREED also features a cooperative multiplayer mode where you and your friends can show the universe what you are made of! GREED is scheduled for release November 2009. Headup Games GmbH & Co. KG is an independently financed publishing company located near Cologne in Germany, founded 1st January 2009. The company targets primarily at male core gamers. In close cooperation with its partners Headup Games releases high quality PC titles in the classical game genres while putting the contentment and gaming experience of the customers first. Supported by a strong distribution network in all key territories the products are planned to be released worldwide. More information can be found in the near future @ www.headupgames.com. You can find a few screenshots of the game right here. Page created in 0.7836 seconds.